https://www.lib.uoguelph.ca/find/find-type-resource/newspapers. Patrons in the library also have access to many external electronic repositories. 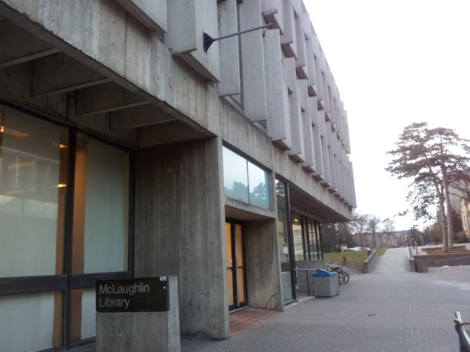 McLaughlin Library also has an extensive Scottish Studies Collection – the largest in the world outside the United Kingdom. The collection is housed throughout the library building including the Archives. At the library all microfilm/microfiche readers are linked to computers so that you can print the pages at a nominal page charge or bring your USB stick and take away your images for free. Off campus patrons are welcome to visit the library and use materials in the library. If you want to charge any material out you would have to go to the Ask Us desk on the first floor and sign up for a community borrower card. A community borrower card is free. This will allow you to take out 20 books at a time. Please keep in mind that some databases are available only for viewing in the library and may not be charged out. Materials in the Archives cannot be signed out and must be viewed in the reading room only. Due to major renovations, the material in the Archives will not be available until January 2018. Not all genealogical material is located in the Archives, though; it is spread throughout the library, and some is available via the library catalogue “Primo” http://www.lib.uoguelph.ca.